After a suitable break I sounded out the idea to a couple of friends. Yep, just the job. So I decided to make two. Not as easy as it sounds. 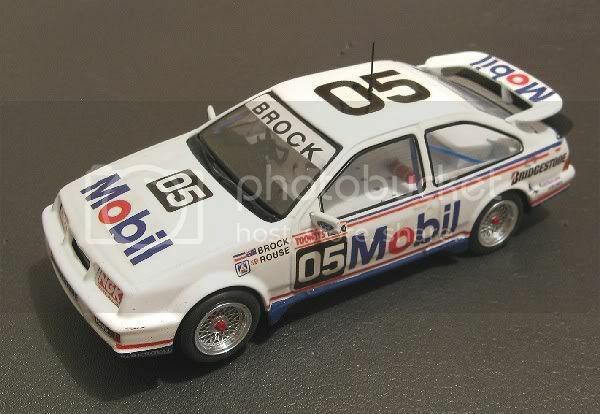 All the regular outlets were sold out of the donor McRae Sierra but further searching realised two locally but at a premium price. None the less, I coughed up the excessive amount and marched off with the models. At this time, a good friend in Adelaide who knew of my plans sent me a Sierra from his stable with a humble request I could not turn down. 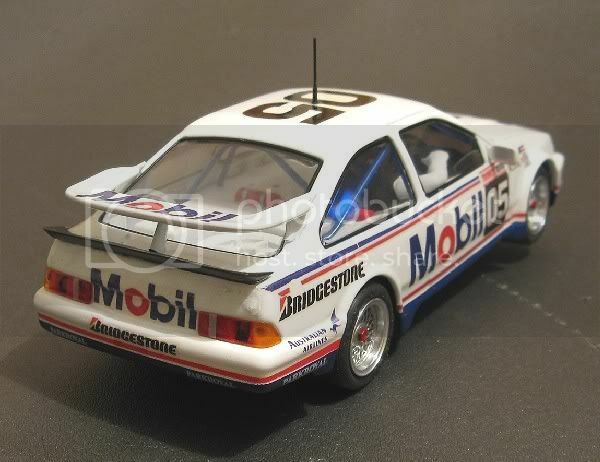 In his case the model was destined to be a track car so it would incorporate some features the other two wouldn’t have, such as a Ninco guide conversion, silicone lead wires, a ‘Wixle’ front end and Slot.It contrate on a drill blank axle. 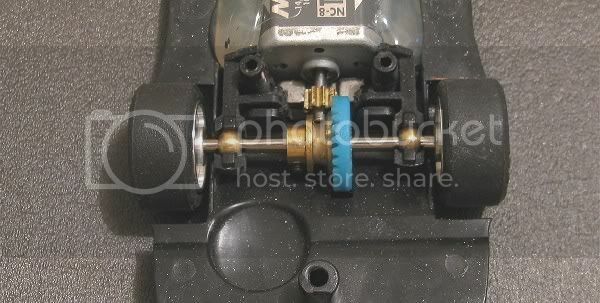 Other mods would be to glue the motor pod in and to mount a Ninco NC8 motor in place of the RX42b. This was to be a lengthy process. Three lots of paintwork, three lots of decals, three lots of right hand drive conversions, in fact, three lots of everything. Was I biting off the proverbial??? Time would tell. First up was the body colour. The model comes in a very hard blue and white livery. So hard in fact that I’ve yet to find a solvent which doesn’t affect the plastic too. After all the clip in bits were removed, the bodies were finished in flat grey. This was lightly sanded and then finished in a thinned coat of flat white. Another drying period and the first coat of gloss white was applied. After a short period of curing the last coat of gloss white was applied. Once again, after a couple of days, a thinned coat of clear was applied. All was left to cure for a week while work went ahead on the chassis details. The decals were, as always, from Bruce Patterson’s. The sheets were coated with a thinned coat of clear to stop them disintegrating during the wet stage and again left to cure. Paintwork on the bodies needed a blue strip around the base of the body. The decal sheet came with this stripe but it wasn’t a good fit and was abandoned on the finished models. The bodies were masked with modellers masking tape and with the defining edge firmly rubbed down with a cotton bud, a thin coat of clear was brushed onto the joint. The idea of this was to stop the colour coat bleeding under the tape and making messy smudges where they weren’t wanted. The blue was applied and the tape removed while the paint was soft. This reduced the possibility of tearing the colour of the body when removing the tape. Then it was time for the decals. Patto’s decals have to be trimmed to size as the adhesive backing covers the whole sheet and not just the area around the decal as with commercial decals. First up were the big bits. The Mobil sign, the 05 and the stripe atop the doors. Each decal floated into place on a bed of clean water and when over the spot the water was sucked out from under the decal using a dry cotton bud. Taking care not to remove all the water, the decals were manoeuvred into position with a sharpened piece of 6mmm dowel. Once in place, the decal was rolled from the centre out, expelling the remainder of the water. Care was taken to leave the model to cure after each side. I had three to do and there was no point in rushing. Once all the decals were on and dried, I applied a thinned coat of clear to fix them. A week later they were to have a final coat of undiluted clear and then forgotten about for a couple of weeks, while I finished off other details. Other details being converting the drivers tray to right hand drive!! I decided to use an open faced half driver from Fly as this was the closest I was going to get for the time. The drivers were mounted on my painting sticks and day by day a fresh coat and a fresh colour were applied until I was happy with the finished article. I wasn’t game to try and duplicate all the helmet decals so I plumped for a straight white helmet with the Mobil One stripes. By now the drivers trays had been dismembered primed and painted. The extinguishers had a fresh coat of paint and the left side dash was blanked off and filled. A new hole to house the instrument cluster and steering wheel was cut in the right hand side. A new dash peak was cut and mounted over the hole and both sides were puttied and rubbed back to a presentable finish. Later on the seat back and the finished driver were to be mounted onto the right hand side and the wheel and cluster were aligned with the drivers hands and glued into place with superglue. I mixed some super strength epoxy and liberally coated all the new pieces in place from behind. This was to give added strength to the superglue. The painted roll cage was reinstalled and this was to be it for the top of the drivers tray. The business end of the model was to have a couple of options. The shelf queen got the motors blue printed. The comm. 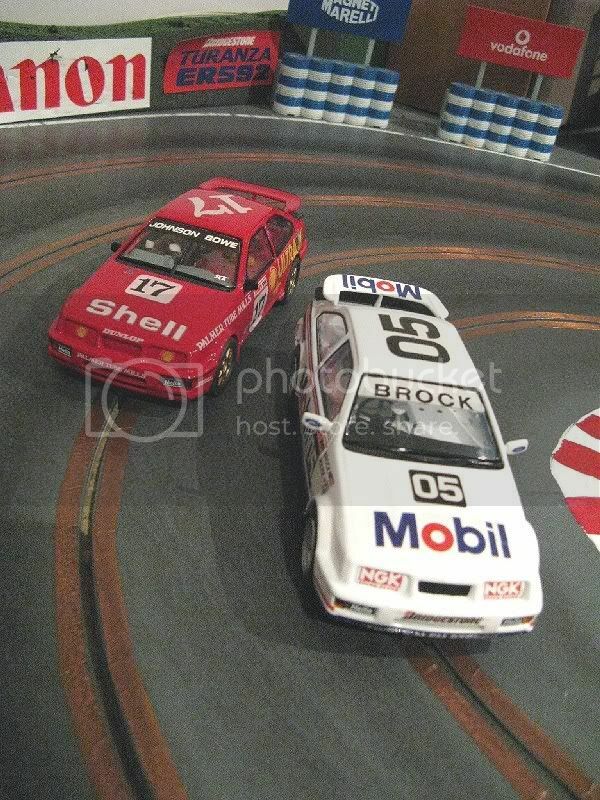 timing was retarded and the armature poles were ground even to increase revs. 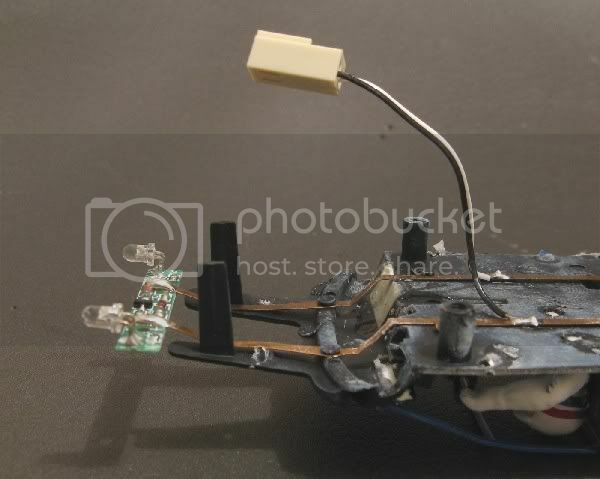 I hard wired the motor terminals to the conductor strips inside the model and I also hard wired the lighting strips using a mini two pin plug to make a detachable join. 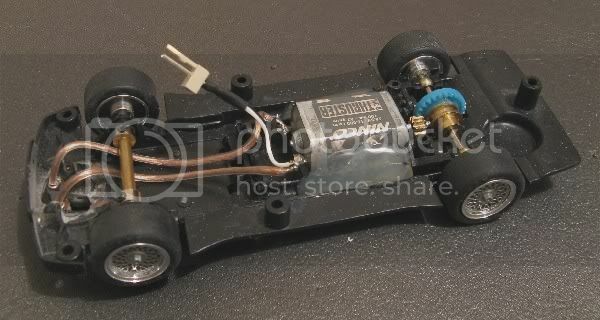 The reason I did this was to remove the indeterminate continuity presented bt the rubbing motor strips and to remove the spring tension of the light strips should I want at some time to race this!! The working chassis had the pod glued into place. The conductor strips removed. 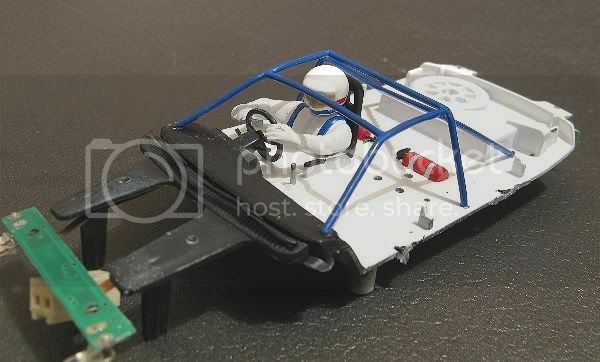 A PCB guide mount glued into the spot where the SCX guide normally sits and the guide hard wired to the motor using silicone leads. A slot it contrate and a drill blank axle were incorporated and the motor pod was trimmed until the NC8 sat in its best spot. 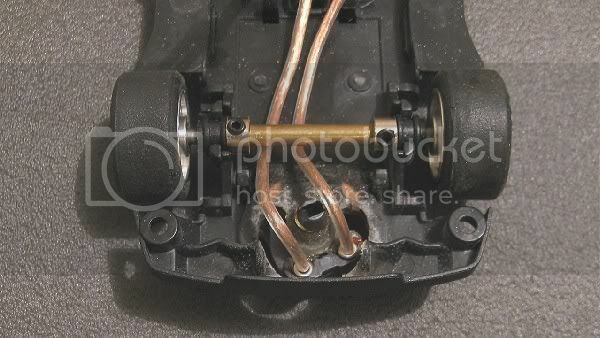 The motor was superglued inside the now fixed pod and the assembly was hot glued to secure it and remove the risk of it working loose. 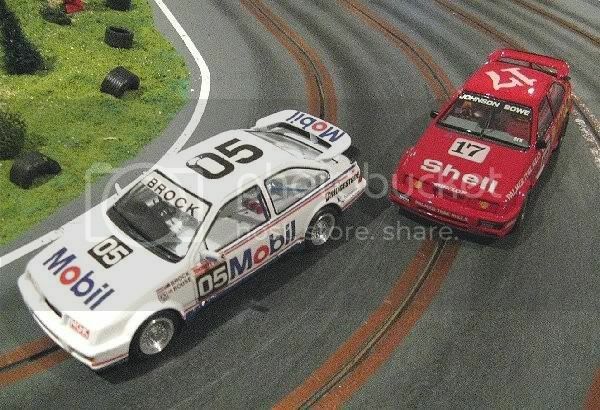 I have a couple of models fixed like this and they tolerated the rigours of racing and you wouldn’t know the difference unless it was pointed out. It also save a lot of messing with brackets and screws and washers and with it avoids the ‘half Plafit’ look! All totally unnecessary. Closing stages were the wheels. 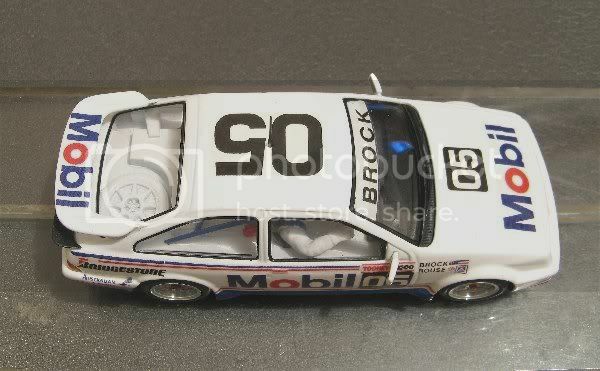 The test model was to stay with its original SCX spoked wheels and the remaining two would get some of Al Penfolds BWA masterpieces. 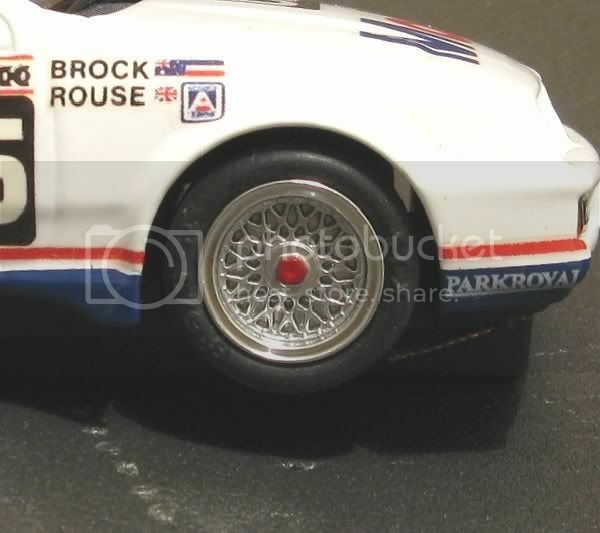 These were with the BBS inserts as the true Brock wheels aren’t made in model form, but they’re hard to tell apart. The inserts sat too deeply in the wheels so plastic discs were made to space out the inserts in the hub. Once again these were superglued in place while the inserts were recovering from a good coat of spray chrome. Inserts were then applied and the whole outside of each wheel was given a coat of thinned clear to retain the aluminium shine. A word of warning here. There was nearly a potential disaster here when the wheels were tight on the extra large SCX axles. Tightening the wheel grub screw before final assembly caused a burr in the axle and at one stage I didn’t think I was going to get the wheels of again. The solution was to mount the SCX axles in a drill and spin them at high speed while sanding the area the wheels were to sit on. Only after I got a loose fit did I attempt to fit the wheels again. As expected, there was no problem with the drill blank axle. While all this was going on, there was the little matter of a duck tail spoiler on the boot lid. This was carefully fabricated out of thick styrene sheet and when happy, they were painted satin black. Final assembly saw me place a strip of blue tack along the back of the model and fit the wing into position. I then removed it without moving the blue tack and applied some clear epoxy to the underside. This was then replaced on the boot carefully in the position it came from and left to dry for a couple of days. Last job was to widen the white band on the windscreen. The Name strip would overlap the existing strip and because of the thinness of the decal, a dual toned stripe would be prevalent. With a coat of white to widen it, the effect was minimised. The front screen then also had a thinned coat of clear. Finally, all the bits could come together. The headlamps, which had been flat whitened before the NGK decals were applied, were fitted. The grill assembly was fitted. The clear window moulding was fitted and pressed into the openings. The driver’s tray was carefully fitted, front lights first, into the body and the rear lights shoe horned into position. Once happy that the chassis was fully ‘home’, I superglued the locating pins down. Lastly, a couple of minor clearance adjustments and the chassis, complete with alloy wheels and the original SCX type seven tyres, was screwed together and the antenna fitted to the roof. And there we have it. 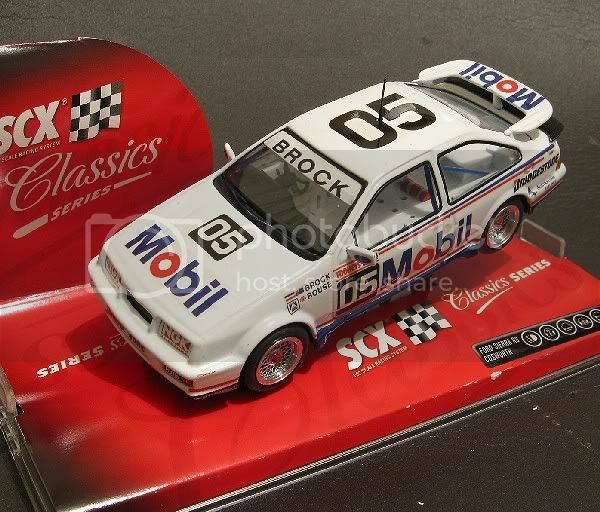 Three Peter Brock Sierras, and four months of spare time here and there!! But what can I do with three Sierras, ALL THE SAME?? Well, one goes in the display cabinet alongside Dickie. One goes to my friend in Adelaide, and the other, which was the test model for the other two. Mmmmmm....... the other.......may well end up on the site we all love to hate with a price on its head,..........but when????? Watch this space!